May 10, 2017 - No Comments! Marriage takes work, time and grandiose amounts of effort. When you propose you are saying to that person “I choose you and am willing to put up with you for the rest of my life.” And put up with them and all the baggage that comes with them you shall. A business-client partnership is no different. When you say I do and take on a client, there are understood vows. Vows that you will protect their brand, help them in times of crisis and be a catalyst of innovative thinking. As the ad agency, you are to be the provider and protector. You said “I do”, now you must follow through by taking measures to make the marriage a successful, long lasting and happy one. That baggage that was promised? Yeah, it’s just as real as an actual marriage when you beginning working with someone new. Any previous damage is now yours to inherit. But inherit with a smile you will as you are lucky to have such a desirable partner. Implement your crisis communication and strategic planning to avoid any future messes. Your goal remains to protect your client and their brand at all costs. Keep this marriage from becoming a divorce by developing effective strategies to fix any given problem before it even arises. To avoid internal crisis between you and your client, stick to the mission and objectives of your partner. Not listening to your client’s wants and needs is just like not listening to your spouses’… and we can guarantee that your client will give you far less chances to redeem yourself than your spouse. So, if we want to keep the boxing gloves where they belong---in the ring--- then let’s make sure to tune in our listening ears. There’s no worse faux pas than drifting off brand or strategy because a lack of due diligence. Be an intuitive spouse. It’s one thing to fall in love and it’s another to stay in love. To keep the spark from burning out with your client, your work and ideas need to come to fruition. Don’t just skim the surface. Bring the innovation, creativity and energy that spawns a new perspective of the client’s beloved brand. Your ideas must be fresh and new, unlike any other brand in that industry segment. But still maintain your client’s identity. You must give your client the confidence and trust to stay with you long term. Making your marriage last with your client is important. All good things come to an end. But your relationship doesn’t have to. What’s most important is their happiness in your marriage and your ability to communicate honestly and efficiently. This can be achieved through a compilation of managing crises, listening to desires and bringing the best ideas for their company to fruition. 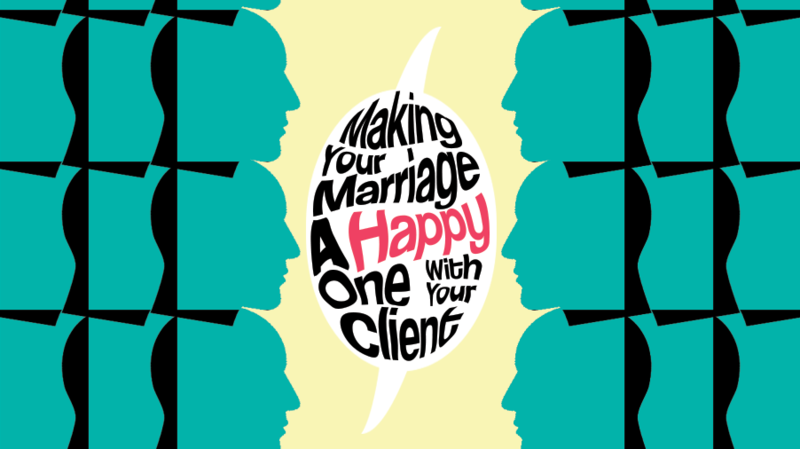 Don’t strive for a mediocre marriage with your client. Strive for one that will last beyond the golden years.